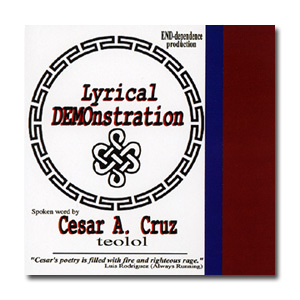 Cesar A. Cruz is an internationally renowned poet, educator and human rights activist. From marching 76 straight miles to hunger striking for 16 days, Mr. Cruz has dedicated his life to fighting injustice. His relentless drive and passion has touched the lives of many, and his writings have received praise from activists and scholars throughout the world. Author Rodolfo Acuna sees "Cesar as one of the new martyrs of our people." Acclaimed author and activist Luis Rodriguez depicts Cesar's writings as filled with "fierce insight and righteous rage." But Mr. Cruz shrugs off the accolades with a humble smile and a thought. "I'm not important; we're but seeds of social change. Our role is a simple one;'To comfort the disturbed, and to disturb the comfortable.' Nothing more, and nothing less! Poem: prop 54 in (kkkon)text: "Propositional Politricks"
9/11 (911): A North-American Tragedy: The Loss of "Human Intelligence"
Molotov: The Rage of the Young and the Restless!